How lucky are we to be doing work we love, in a flexible way that works for us and our families. We should be celebrating this fact, but instead, as we look around, we see workplaces that are not adopting flexible approaches fast enough and people crying out for flexibility and not being heard – or oftentimes not crying out at all for fear of the consequences and living with constant frustration or quietly exiting and desperately trying to find an alternative. Helen and Leonie decided that rather than pour another wine (well, actually as well as pouring another wine), they would go out and see what could be done about this state of affairs. 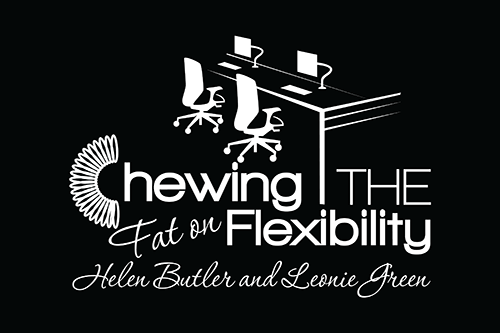 Helen started a Flex Connect Community as a means of starting a conversation online about what’s happening, what’s good, what are the possibilities, what can we see elsewhere that might suit our workplaces here in Australia. And then having been completely obsessed with the podcast Chat10Looks3, Leonie and Helen decided to harness their inner “Crabb and Sales” and try the podcasting world – it seemed to naturally suit their enjoyment of chatting and being an audio format rather than video, they could do so in a very flexible way, with a glass of wine in their hands wherever possible! Leonie and Helen both run their own consulting firms, Helen launched Inspired People Solutions around 10 years ago, and Leonie launched Conscious Workplace two years ago. As you might be able to glean from the business names they chose, they were both looking to do something slightly different from the norm. So flexibility as a topic of conversation is a common one, and one to which they both bring a level of expertise and passion.